inDemand is looking for 12 European regions interested in innovation in Healthcare. The selected regions will learn how to implement the new model based on a demand-driven, co-creation approach. Throughout the inDemand Community, the regions will benefit from mentoring and a tailored support to skyrocket digital health and network with stakeholders of the 12 selected regions with similar interests. “inDemand is a new European project based on a model where healthcare organizations and companies co-create eHealth solutions. They receive the economic support of regional funds, and the business advice of eHealth experts”, explains Jorge González, inDemand coordinator. “We encourage those regions interested in the digital transformation to join the inDemand Community and learn new ways to efficiently implement innovation”. The process to submit the application is explained on the inDemand website. If you want to know more and missed the inDemand Community webinar, watch it on Youtube. 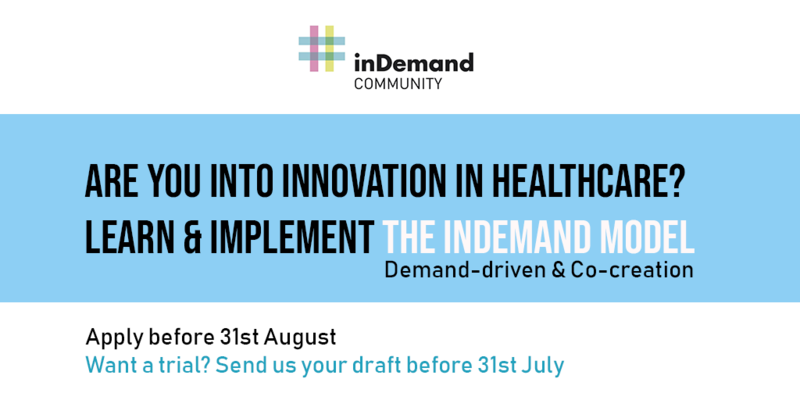 Learn new ways to innovate in healthcare joining the inDemand Community. Our innovative model is being implemented in 3 pilot regions: Murcia (Spain), Paris (France) and Oulu (Finland). It is a model born to be replicated and implemented in other regions. Only 12 European regions will be selected. Don’t miss out this opportunity! The inDemand project has received funding from the European Union’s Horizon 2020 Research and Innovation Programme (GA 763735).